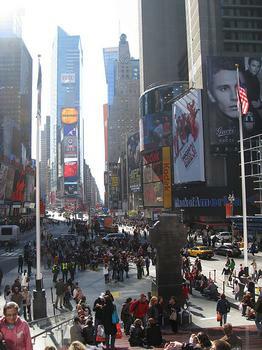 A ticket booth selling discounted Broadway and off-Broadway shows. A ticket booth selling discounted Broadway and off-Broadway shows. However, the cheaper tickets aren't the only attraction, as the back of the booth is a large, red-lit glass staircase facing Times Square, which serves as a set of bleachers and offers an excellent opportunity to get above the street and just watch the crowds and flashing signs.